Metal stamping facilities, In-vehicle infotainment, Data-logging on bridges. What’s the connection? Shock and vibration. If you are in an environment where your computer is going to be knocked around, vibrated, shocked or just shaken every which way, you’ll need to vibration-proof your system. Let’s take a look at the 6 Gotchas of vibration-proofing your PC. First and foremost, the easiest thing to do is replace all hard drives in the computer with Solid State Drives (SSD). While you can get shock pads to mitigate vibration effects, platter hard drives are very sensitive to shock –swift blows can cause damage to the platter– and vibration –constant shaking will throw the read and write heads out of alignment– which just means they should be gone. SSDs have no moving parts, and are perfect to take the shake. However, cables that connect SSDs are another matter. Connections are the greatest points of failure for cables inside your PC. Either a steady shake or a swift blow can easily knock a cable loose. The first priority? Remove any and all superfluous or extra-long cables. If it is not in use, get rid of it. If it is a multi-function cable and you don’t use all the functions, replace it. Eliminating all dangly bits prevents that much more movement within the system. The X, the Y and the Z – When you think about vibration, remember it is not just back and forth or up and down. 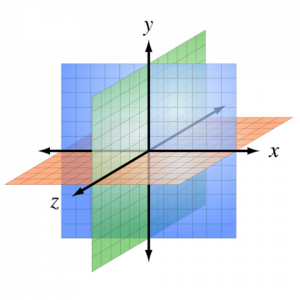 Vibration can happen in three dimensions. When analyzing your need, don’t forget the Z axis or you might watch your PC fall to pieces. If you aren’t using zip-ties, it’s time to start. Use them to connect various free floating cables together and minimize movement. But beware, bundling cables is a fine art in itself. You want a taught, but not too taught, so the slightest motion doesn’t pull a connection out; snug, but not too snug, so no sharp edges or heat sources damage the cables; and well secured, but not too secured, so the zip-ties don’t hurt the wires. In the end remember: The fewer moving parts, the better. Put aside I/O & processing power for a moment and focus on a motherboard’s capacity to resist vibration. First, look at the size of the motherboard, and more specifically the distance between the points that connect it to the case (or the internodal spacing if you want to get technical). The more space there is between connection points, the more wobble. Like a piece of sheet metal held between your hands and shaken, the motherboard will flex and shake. Smaller form factors like Mini-ITX have close screws, reducing the wobble. Fanless boards will also tend to have a heat pipe, which rests on the board, and a pad under the board. This creates an additional anchor point and is another good argument for going fanless. Keep an eye out for certain motherboards designed from the ground up to resist vibration. These feature stiffer boards, fewer components that might shake themselves loose or break (like Electrolytic Capacitors), strategically placed rubber bumpers, and power supplies that can take a pounding. However, the best motherboard in the world –with the best drives and cabling– still needs to go in a good case. Imagine a PC sitting on top of a washing machine in motion. The PC will dance all over the place! If you place your hand on it, it will move less violently. This is what mounting does. By attaching the PC to a larger object, even if that object is in motion, it reduces the vibration and shock. Even so, you just need to pick the right spot with the least vibration. 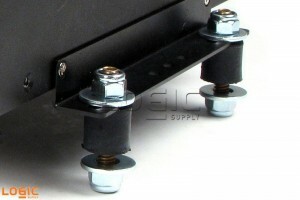 With specially designed mounts, like Vibration Isolation Mounting Kits, that vibration can be further mitigated. As mentioned above, keep an eye on where the mounts are. Vibration is a serious issue and an unprepared PC can be torn apart by even the smallest of vibrations over time. If you are hearing a rattle from your PC, watch out and take a good hard look at your environment. Then, make sure you have the right PC with the right protection. Logic Supply’s engineers have expertise in solving vibration concerns, and a vast toolbox of solutions to match your particular need. Contact one of our specialists to consult on your environment and put together a verified system that can handle whatever you can throw at it. 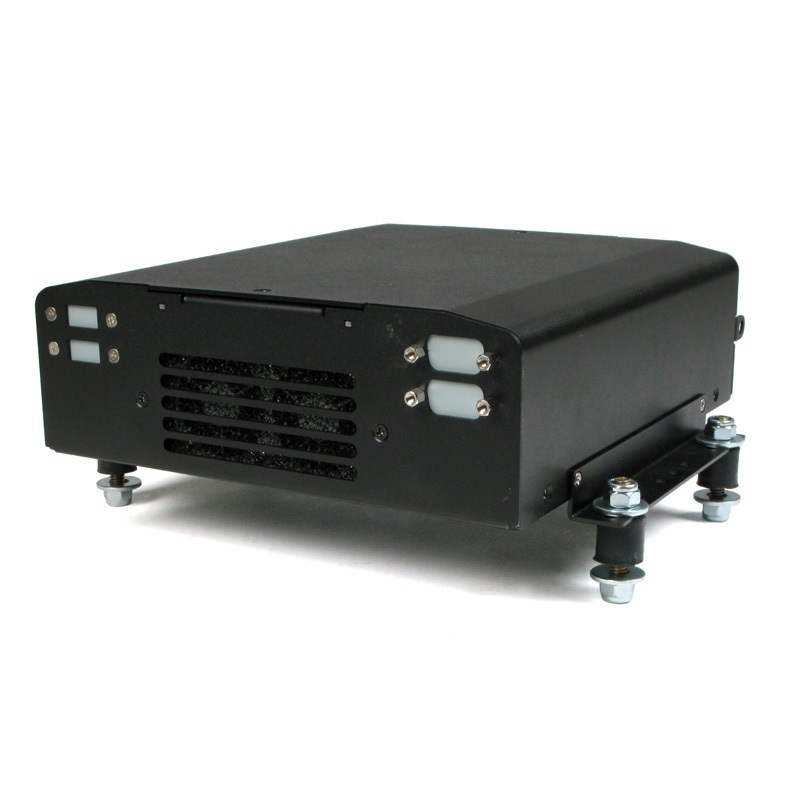 Explore our Rugged Line to browse systems with enhanced vibration resistance.